OOAK statement pendant, reversible, unisex design. 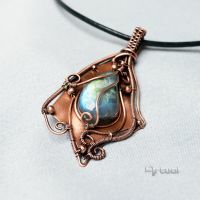 Copper wire wrapped green-blue Labradorite cabochon, oxidized for antique look, polished to high shine and sealed with a clear glaze. I just ran across this on Pinterest. It grabbed my attention immediately. Stunning work! YW and have a llama! Your wirework is absolutely meticulous. 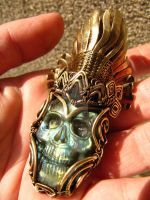 This is a beautiful piece! 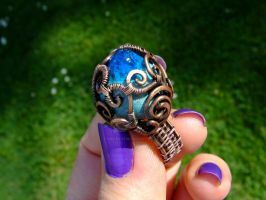 So much of the wire wrapped jewelry I've seen has an unfinished look to it, but this is very well done. Good job! A joy to look upon. THAT is WONDERFUL! 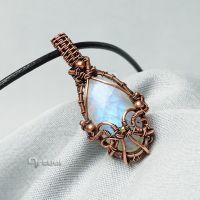 That labradorite is amazing, and the wirewrapping works so well with it. 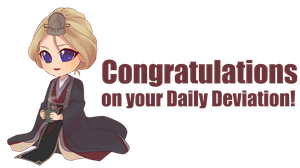 Congrats on the DD! Beautiful work, congrats on the DD. Exceptional work! The intricacies of the knot and the way each of the three wires remains flat and in proper place is exquisite. Bravo!